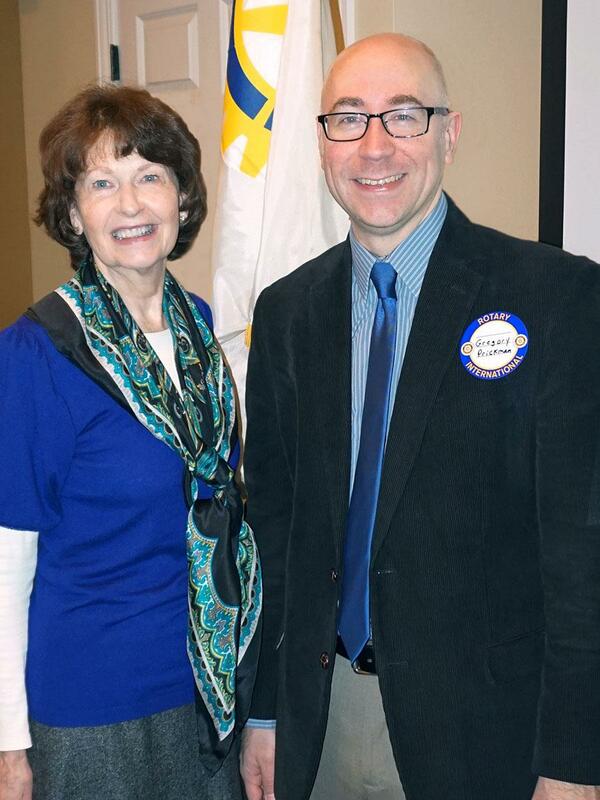 Rotary File for January 17, 2017 | Rotary Club of Iowa City A.M. The speaker for January 17 was Greg Prickman, UI Director of Special Collections. Congratulations to Mike Deninger and Peggy Doerge for reaching a new level as Paul Harris Fellows. 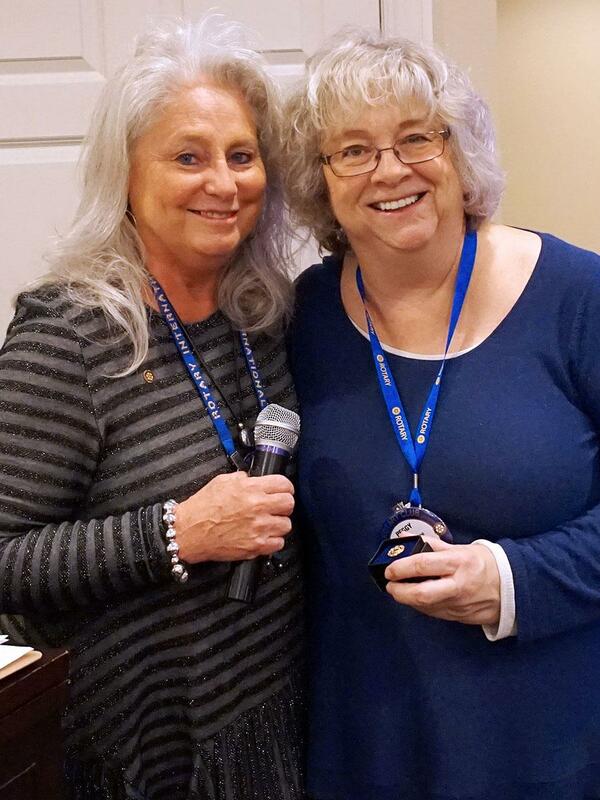 The special pin awarded to Paul Harris Fellows recognizes reaching a level of $1000 in supporting the Rotary Foundation and each subsequent $1000 in contributions. Photo: Deb Dunkhase and Peggy Doerge with Paul Harris + 3 award. The gift wrap holiday fundraiser raised over $1000 toward our various programs. Tonight is the Trivia Nite fundraiser at Mellow Mushroom. There are 9 teams but two team could actually use some additional members. Cost is $25 per person. The can sorting project had about 10 people at the session on Saturday. Sign up for the remaining can sorting slots on one Saturday each month through the year. We want to have 5 or more people each month. The Childrens Museum appreciates the work we did over the holidays to cut felt for a Play to Read project. They actually need a few more felt pieces cut before Feb 1. Contact Deb Dunkhase if you can help with more cutting. Next Tuesday after the meeting the Fundraising Committee will meet. We received thank you notes from some of the junior high libraries that received books from us. Greg Prickman, UI Libraries Special Collections Director, discussed changes made to archival services in 2016 and what is ahead for the coming year. Actually, quite a lot is new with the use of space at UI Main Library in 2016 because of the updating of the Learning Commons on the first floor. Some exhibiting space was outfitted with security and environmental safeguards on the first floor also, and that is where the Archives have set up several major exhibits in the past year including a one month exhibit of the First Shakespeare Folio which was on loan from the Folger Shakespeare Library in Washington, D.C. Other big changes for the library as a whole this past year was the implementation of a high density storage facility off-campus on the East side of Iowa City for the storage of less used print materials, and the revamping of the online catalog system called InfoHawk. The Archives received Tom Brokaw's papers in September and had him as a guest on campus later in the year. A collection and website called Migration Is Beautiful was set up in conjunction with the Iowa Women's Archives. This has been a 10 year project to collect oral histories and stories from people who have migrated from different areas to Iowa. Another fairly new collection and website is called Uptight & Laid Back, a collection of audios and videos that tell the story of Iowa City in the 1960's. The Archives have also increased substantially their efforts in providing instructional use of the archival collections. These collections can only be used on-site. In 2016 there were 248 sessions held, a 12% increase over 2015. Prickman shared information about the main areas of acquisition for the archival units of UI Libraries. The highest expense was for the purchase of a particular collection in the area of film and TV. The book arts for fine press and hand made book materials is the second largest area of the budget currently. UI has one of the best fine and hand press collections in the country. The third budgetary priority this past year was for Inconabula, which are materials printed between the time the printing press was invented in the 1450s and 1501. The next highest area of spending was on medieval manuscripts. The latter two categories receive quite a bit of attention for instruction purposes. It was pointed out that there is a growing Rotary collection at UI Libraries. Prickman also debunked the myth that one needs to use gloves to handle archival material. In fact, gloves tend to do more harm than good when handling old and fragile materials.